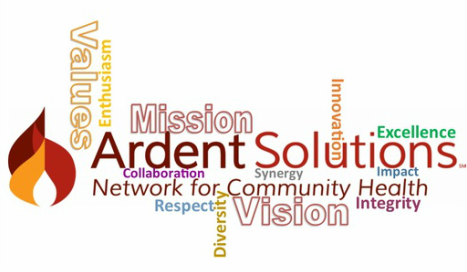 Our Beliefs, Mission & Values - Ardent Solutions, Inc.
To create synergy within and between systems, organizations, families and individuals that result in a strong culture of health and quality services for our communities. Working together proactively we will create a healthy, livable community for all. ﻿Innovation - We constantly seek new ways to accomplish our work and to generate extraordinary results. We are dedicated to delivering creative and forward-looking solutions and expanding the voice of rural health. Respect -We extend consideration to fostering a fair, open and honest workplace environment. We listen to the ideas and opinions expressed by others. We treat others as we would wish to be treated. Integrity - We uphold a standard of transparency, accountability and reliability. We conscientiously perform our operations to promote a workforce that is worthy of the public trust. Excellence - We fulfill our mission by providing relevant and timely activities that reflects our commitment to collaboration and the highest standards of quality. Diversity - We honor employees and partners through inclusiveness and respect for the various perspectives and backgrounds that each brings to the table.